Because this online book focuses on the ramage aplomado, equipment choices will differ initially from that of the hand-reared. In the first season, the wild-hearted ramager will need to be restrained in early training to a greater degree than does the naturally tame hand-reared hawk. Later on during the first season, when the hawk has learned the game and is down to a proper response weight, free lofting becomes possible and most desirable. The focus here is on the special needs encountered during early training with a recently taken ramager. It is recommend the reader go to Desert Hawking IV: Quail for basic information on later maintenance of a fully manned and manageable ramager. The gear your new ramager will wear during tempering, manning, and early field training will be similar to the same equipment pieces described in other falconry texts. Herein are some useful variations for the reader to add to his or her toolkit of choices. Aplomados can be handled bare fisted without fear of serious injury to your hand, but it is more comfortable for raptor to perch on leather where their talons can get a firm grip while the falconer walks about. It is also a cleaner platform when feeding a bloody meal slick with meat juices on the fist. A glove also prevents a myriad of small infected scratches from developing on your hand. Any leather glove will do. The lighter and more form fitting the better. Removing the fingertips increases sensitivity without sacrificing the above stated advantages. It is useful to outfit the glove with a short leashlet firmly attached to a D-ring or a grommet in the cuff and that can easily clip into the jess holes or even the anklet holes for temporary or long term securement. Again, refer to McElroy for a description of his use of modified electrical clips for temporary securement to the anklet holes in the field. The anklets and jesses will be the first items of gear your hawk will receive during the initial phases of handling. In order to expedite moving from the phases of tempering to guddi manning to open manning to field work, it is recommended the bird be outfitted with the same leg gear intended to be used throughout and not be started with a pair of traditionally designed one-piece mews jesses. Our anklet design calls for lightweight well-treated kangaroo leather carefully cut out to fashion a relatively wide and fold-free anklet. The broad width of the anklet ensures a greater amount of the hawk’s long and narrow tarsus is wrapped by the leather, thus distributing the stress of the tension caused by a bate over a greater area, therefore significantly reducing focused shock which can create scale damage, tissue damage, or even a broken leg. The anklet design also allows for a wider slit to be fashioned at the point where the leather band wraps around the leg and passes back through itself. This prevents the leather from folding over in order to pass through a narrower slit. The result is an anklet lying flatter against the tarsi which reduces damage to scales and flesh from abrasion. It should go without saying, an anklet should neither be too tight nor too loose about the tarsus. Over tightness can constrict blood flow to the foot, which consequently may cause the loss of that foot. Tight anklets can also trap small abrading particles, such as sand or tiny pebbles, inside against the tarsus which leads to damage to the flesh. A too-loose anklet can allow the hind talon (halux) to slip up into and become stuck inside it, can lead to damaging abrasion to the leg due too much slipping up and down the tarsus, can allow the federal and or breeder marking band to slip into and potentially under the anklet (leading to potential cutting or abrasion to the upper region of the foot), or can lead to weakness of the leather and breakage or slipping off the foot altogether. Related to this problem of too-loose leg-wear, it is important prevent extra stretching and unwanted loosening from occurring after attachment of the leg-wear to the bird. Be sure the “stretchy direction” of the leather used to fashion anklets (and jesses) runs in the direction of the width of the anklets (and jesses) and not the length. By ensuring the length-direction of the anklets and jesses are non-stretchable, one can be sure the fitting of these pieces of equipment will remain correct throughout the time the bird is wearing them. The anklets offered herein are intended to be sewn to themselves rather than bound together by a metal grommet. The removal of metal grommets reduces both the possibility of abrasion to the foot or leg--due to the metal edge of the grommet eventually becoming exposed or twisting around into the flesh--and the potential for electrocution--by removing a possible conductor during those unexpected moments the hawk is at risk when landing on a power pole. Jesses should be thin, strong and rather stiff. The best ones can now be commercially obtained from the better supply houses and are tightly braided and outfitted with metal buttons. If one fashions jesses at home, it is important to use a heavier grade of roo hide compared to the anklets so a thinner jess is made that will spin freely within the opening of the anklet without compromising strength. Again, jesses should be cut out such that the stretch direction of the leather goes to the width of the jess and the non-stretch direction goes to the length. Jesses should be outfitted with a small hole braided into or (if leather) punched into the terminal end of the strap. This hole should be as small as possible, but still be large enough to easily allow the tine of the securing clip to slip in and out as needed. Normally the jesses are removed from the anklet when the hawk is flown, free lofted, during tempering, for breeding, or during the molt. One of the aplomado’s many curious idiosyncrasies is her tendency to grab her own tail feathers in one of her “hands” upon returning to glove or pole perch from a bate. It seems no matter how carefully you adjust and re-adjust the length of her jesses, she will somehow find a way to do this. In all the times I have observed aplomados returning from a bate with a tail feather (or two…or three) in hand, I have never known this to result in one feather to be actually be broken. So, fight the good fight, and continue to adjust your leg gear and perches in an effort to beat this peccadillo. My best recommendation is to use 5' jesses (the length of the jess "strap" exiting the anklet). Please contact me if you invent the foolproof solution. In the meantime, should the tail grabbing happen, do not panic, help undo the entangled situation gently, then move on. After the hawk has received the extent of tempering you intend it to have (see Time Out for Tempering), it will be removed from the tempering chamber and placed into a guddi for a period of one to two weeks. At this point, one must have a good fitting hood on hand, a roll of 3” wide Vet Wrap (or Coban), and a modified tethering system with which to secure the hawk’s jesses to a tangle free but very short tethering system. For detailed instructions and illustrations on placing a guddi on a raptor, borrow (or, better yet, buy) a copy of my book Hoods, Hooding & Hoodmaking. Additionally, one will need two separate manning stations, one elevated and one at floor level, dedicated to the process of guddi manning. Later, the tethering table, used for longer term tethering, will be discussed. At this point, a much larger surface is required, one outfitted with a low, movable perch. The guddi-training tethering system will include a standard heavy duty fishing clip commercially welded to a quality ball bearing swivel. The less expensive and more available simple metal fishing swivels are dangerous to use for tethering and will assuredly break within days of implementing their use. The swivel is secured to a very short stiff segment of light Teflon coated braided metal cable attached at the other end to a small but good quality carabineer. The total length (including jess length) should only exceed the tip of the hawk’s train by a few inches, a total of about 10” from anklet to end of system. On first wearing the guddi, an unmanned falcon will display fear and loathing at an approaching hand. But if she is hungry, and the approaching hand holds a juicy tidbit, her fear and loathing changes to curiosity. Her curiosity will be satisfied by the taste of the tidbit. Now she is more interested in obtaining the tidbit then she is afraid of the hand that is feeding her. And she can be coaxed to approach toward the very thing she shrank from before. The situation is now seeming very different from her first impression. It will not take long and she will relax and stand tall without fear. Her training has begun before she has ever been taken up onto a glove. A group of aplomados being socialized in guddi's in preparation of formal training. By the time these birds are taken up onto the falconer's gloved hand, they already are familiar with the approach of a human hand. A large, flat expanse of countertop must be created at about waist level and covered with clean astro-turf. A full 8’ x 4’ sheet of at least ½ inch thick plywood set on a base of three evenly spaced saw-horses will do. Because your hawk will spend two weeks on this surface at most, and because you may wish to dispose of the soiled turf afterward, and because the guddi will prevent the hawk from bating and landing with a jolt upon the surface of the counter, one needn’t spend a fortune on the highest level of quality of turf normally demanded for use on long term perching surfaces. However, the turf must be new or sterilized before tethering your hawk upon it. A tethering ring must be securely fastened at the mid point of the surface such that the hawk cannot come near the edge. Should it approach the edge and topple over, it would surely hang there and possibly die. Equally as important as the raised guddi counter is the guddi floor mat. This should be a large square of circle of turf (at least 4’ x 4’ square or 4’ in diameter). This mat is designed precisely as the guddi counter in terms of material and having a securing ring at the center, but it is laid flat upon the floor of a room in the home in which there is ongoing activity so the hawk is always observing human movement and continues to become more and more accustomed for the duration it is in the guddi. The hawk should not be placed on the floor until it has gotten over its initial fear response at waist height and has learned to accept tidbits from its falconer and shows active interest rather than fear upon the falconer’s approach. Since there will be times during the period of a single day it is desirable to have the hawk sometimes at waist height and at other times on the floor, it is recommended the falconer have one of each type of station in the home rather than attempt to convert one to the other and then back again, which would awkward and time consuming at best. Once the hawk has become accustomed to life in the guddi, it will be more comfortable and well adjusted if provided with a safely designed low perch to hop up onto. One is surprised at first by the alacrity with which a guddied hawk can do this. The best design for use during this phase of training is a simple plastic flowerpot about 6” at the wide point and tapered down to perhaps 4” at the narrow. One must attach a steel ring to the “bottom” of the pot (see illustration) then invert it to its normal “upright” position and fill it with freshly mixed concrete. After the concrete is hardened, the pot is once again set upside down (which now becomes its new right-side-up) so that the ring is at the top. A round piece of high quality astro-turf is adhered to the narrow end of the newly fashioned block (a slit must be cut into the turf to allow passage of the tethering ring through it) and the hawk can now be safely tethered to it. Though heavy to lift and carry, the block is easily placed wherever one wants it and is heavy enough an aplomado falcon cannot drag it off its mark and into danger. Since the hawk will not bathe during its rather short stint in the guddi, one need not (and should not) provide a bath pan. Be sure there is ample ventilation in the room, the tethering stations are never placed in direct sunlight, and air conditioning is provided if needed to maintain health. While in the guddi, the hawk will often be unhooded and observing activity around it. However, the guddi restrains the hawk from avoiding the hood going onto its head during hood training, so this is an ideal window to initiate and reinforce hood training. The style of hood most recommended to use with aplomado falcons was designed by Jim Nelson and an entire section devoted to its manufacture and use is included later on. Suffice to say the falconer should have several on hand before the hawk arrives: one of the recommended size for an average hawk of the gender to be received as well as one a size larger and another a size smaller in case the individual received is not of average build. A leashing or tethering system is one of the very important considerations when keeping any raptor in captivity. Free lofting is the preferred method with raptors tame to the fist or not being handled in any significant way. So a hawk which comes readily to the fist in the mews or is molting or part of a breeding endeavor is best left free of as much legging material possible and completely free from tethers holding it in one place. Earlier in this chapter the anklets, jesses and guddi-station leashes were examined, but here leashes and tethers used for long term perching and during transport are the focus. The traditional leather or a modern synthetic braided leash secured to the swivel just below the jesses and then tied to a swiveling ring on the perch is always a viable option. Very few falconers use actual leather leashes these days, because good leash-leather is less readily available than are the synthetic cords used for whole leashes or nylon strands used for the braiding of a more sophisticated falconry leash of the Eastern or toblaca design. A third option, braided metal cable leashes, must be constructed and used as it is designed to be used. Cable leashes are fabricated from light gauge braided steel cable that is encased in a flexible but durable Teflon coating. This Teflon coating is essential to prevent free strands of cable fiber from puncturing the flesh of a hawk or abrading other components of its equipage. The coated steel cable is light and stiff so it is not a burden on the hawk’s legs, and it does not easily entangle. Because it is so stiff, it is not possible to tie into a knot as with the leather or nylon cord leash options. Therefore, it is necessary to permanently affix it to the clip swivel at one end of the system and to a clip or carabineer at the other end. The carabineer option has some real advantages, but also two significant drawbacks. The advantages include unparalleled ease in clipping and unclipping the tether. The drawbacks are the smaller types (which are desirable by size) tend to have a limited “lifetime” and should be frequently examined and discarded if they begin to stick or look as though they might break. Also, under very special circumstances, through bating and turning in a random but significant manner, a carabineer can actually find its way into a position against the tethering ring such that it can self-open and become undone. It is, therefore, essential to include the tubular “lock” preventing the carabineer from opening up under any circumstances other than by falconer choice. Since the manufacture and use of the cable leash is easier to display rather than describe, a series of illustrations are provided to show how this is correctly accomplished. What remains to be stated is when crimping the metal ferrules holding the cable in place, one must apply a great deal of crushing force to ensure the ferrule permanently holds the cable and prevents it from slipping loose. A table vice is an appropriate tool for accomplishing this. Vice grips or pliers will not apply nearly enough force to hold the cable, though it will deceptively appear to do so at first, only to fail at some future moment when its hidden weakness is tested fully by a well-timed, well-positioned and unexpectedly forceful bate. After the guddi period has passed, the guddi will be removed never to be replaced on this bird again. Now the hawk is capable of spreading and flapping its wings, and as such is capable of bating. It will now spend more time in the hood then out of it as it transitions into traditional phases of falconry training. Only when it reliably can be called to the fist and lure outside on a creance will it be considered fully manned and allowed to be left unhooded the majority of the day. At this point, a different tethering system is called for, one restricting the hawk’s movement enough to prevent it from free flying about the room but allowing it to hop down from the perch to drink or bathe from a nearby bath pan or hop over the falconer’s gloved hand as required. Many other perching options exist, but one that Nelson designed and has been modified by others including Ramirez is a miniaturized and elevated version of the “trolley” system. The design, dubbed by Nelson as a “table perch” or “tethering table,” allows the falconer to keep the hawk indoors and tethered while still meeting all of its “weathering” needs in every way but one, being in healthy contact with appropriate amounts of direct sunlight. Since the table perch is much easier to illustrate than to describe, images have been provided to demonstrate the system and provide basic information on it typical construction. Because daily and significant periods of contact with direct sunshine is necessary to the health of the neo-tropical aplomado, it is recommended some sort of weathering area be provided to allow for sunlight access for significant periods during each day. Once the hawk is fully trained and reliable, the best system to be used is a free loft chamber or mews within which the hawk may choose where to position itself to be most comfortable and healthy. In the northern states where winter temperatures regularly fall from the low twenties through sub-zero it is a good idea to install a localized heat source near which the hawk can voluntarily choose to perch to receive the benefit of an external heat source. That said, experience reveals this smallish neo-tropical raptor is nonetheless very hardy when it comes to enduring cold temperatures. Even with a heat lamp option to choose from, several falconers including the authors have observed on some very cold nights, even sub-zero, the little hawks choose to perch across the chamber away from the heating source. But other individual hawks habitually choose to perch right underneath the lamp on those very same nights. Therefore, it doesn’t hurt to err in favor of providing a heat source. When supplying a “heat can” above a perch in a free loft area, be certain to attach the upper surface of the can directly to and flush against the ceiling. There should be no gap that might attract a hawk to attempt to land on or hang there for even a moment. A lit lamp could potentially heat up the metal of the can such that contact might cause damage to the flesh of the toes or legs of the bird. The lamp should be no nearer than 2’ from the perch which should be horizontal in design and long enough a hawk can choose to sit directly beneath the lamp for maximum warmth or move away to any position to adjust for its own comfort. To see some images of this "heat can" solution, see the Breeding page on this website. Traveling cadges are an important piece of falconry gear assuming the hawk(s) is/are not carried inside a “giant hood” (hawk carrier). Though illustrating here one design used by American Bird Abatement Service, the main point is to provide a perch surface wide enough to drill a 1 ½” hole into such that a small carabineer can be slipped through without resistance. Be aware one must ensure the jesses do not entangle with this system. To reduce this tangling problem, be sure the lip of the hole is smooth and free of any sort of obstruction causing the jesses to bind and twist. Also, be sure to connect the clip to the holding ring below the perching surface so the clip rides below the surface of the drilled-out hole and the jesses themselves enter into the mouth of the hole such that their connection to the clips remains within the tube created by the drilled hole. Aplomados have an amazing ability to tangle themselves and need to be constantly monitored whenever they are tethered using any system. They also have unerring ability to grab their own tail feathers in their talons when recovering the fist of perch after bating, so again, if you choose to transport your hawks on a cadge, the minutia involved in preventing entanglement is well worth the effort and attention to detail. The other major transport option is to use a “giant hood” (aka hawk box or hawk carrier). Once the ramager is trained sufficiently and is reliably coming to the fist without hesitation and is over its fear of the towering human form, the hawk box can become a reliable option for transport. Since it is so well described and illustrated in Desert Hawking IV: Quail the interested reader should go to that book for more information on its manufacture and its use. A small merlin-sized bell of quality falconry make can be an asset when hawking or pursuing abatement within a wooded grove or orchard. We do not necessarily recommend aplomados be regularly hunted in wooded areas because it is not their strong suit and there are intrinsic dangers from attack by other aerial predators such as Coopers hawks, redtail hawks or great horned owls once inside a wooded canopy. 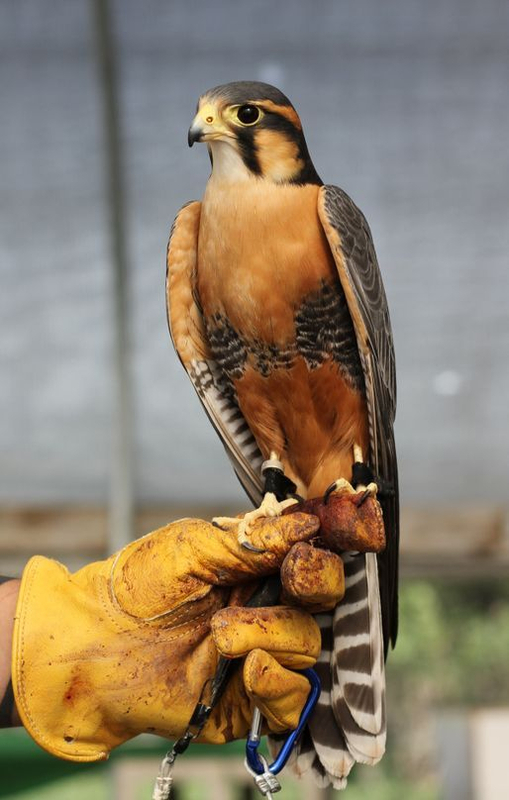 However, recognizing there are times the falconer may choose or be forced hunt inside a treed canopy or in an area of tall grass or thick cover, the addition of the bell makes relocation when within earshot much more convenient than the constant employment of telemetry. The downside of the bell is that they can become caught on foliage if the hawk is working inside cover, and they are a disadvantage if the bird goes AWOL at the end of the dy and spends the night out. A sound of a bell can pique the curiosity of a marauding owl. Currently there are numerous choices for telemetry systems available. They are well described by McElroy in Desert Hawking IV: Quail. Here the authors unanimously recommend aplomados be outfitted with backpack systems and, for both males and females, a Marshall Power Max or similarly ranged and reliable transmitter be employed. Power, range and reliability are the elements leading to the return of an errant aplomado when the going gets tough. Getting swiftly to the bird can make the difference between life and death or permanent loss. 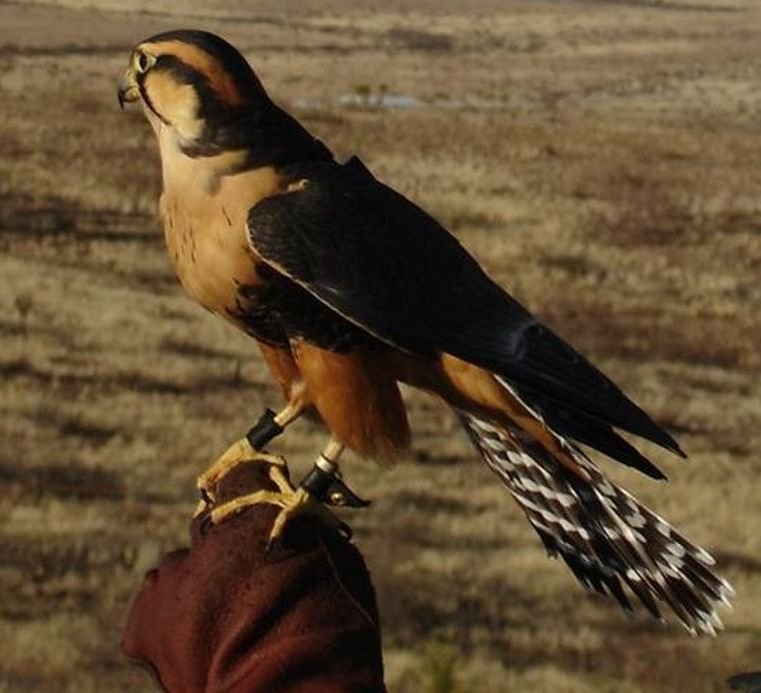 There seems to be very little advantage in using even the most highly touted micro telemetry, because inevitably aplomados will carry them out of a “certainty range,” and time wasted trying to relocate the signal through random wandering, driving to high ground or taking airplane rides is offset by the “hassle” of outfitting the small falcons with backpacks upon which they can more easily carry and support the slightly larger and significantly more powerful full-sized transmitter. We also have found larger transmitters to be more reliable and less likely to malfunction than do the micros. As for receivers, get a good one. There are many to choose from. Saving a few dollars won’t seem clever if you cannot be certain your “bargain” receiver has the range finding abilities of the high quality models. Lures do not require a great deal of discussion. They need to fit easily into one’s pocket, have enough weight such that they can be swung about easily (even in the wind), be outfitted with a meat securing device (quick and reliable); and have a lure-line long enough to be able to maintain some hand control of the lure even when it is tossed out and away from the falconer. 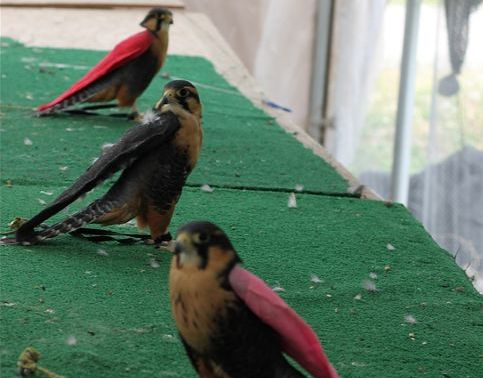 They are easy to make and readily available from falconry outfitters. The absence of mention of any particular equipment type in this section does not suggest it has no use in training ramage aplomados. Provided below is a list of recommended general falconry books to refer to in order to provide the basics of hawking for the beginner.